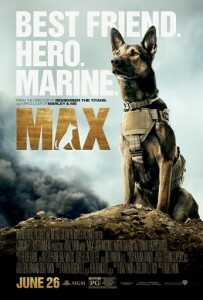 NEW YORK (June 22, 2015) – Iraq and Afghanistan Veterans of America (IAVA), in partnership with Warner Bros. Pictures and MGM, will host nationwide VetTogethers Saturday, June 27 for screenings of Max – a touching family-friendly film about a military working dog and his handler. Complimentary tickets and pre-screening events are offered to IAVA members and their families in more than 35 cities nationwide, and IAVA will have support and program information at each event. The film, loosely based on a true story, follows the journey of a military working dog whose handler is tragically killed in Afghanistan. Traumatized, the dog is adopted by the family the Marine left behind. This release of Max, which directly tackles the issue of Post-Traumatic Stress Disorder (PTSD) experienced by both veterans and service animals working in combat zones, is timely as the nation recognizes June as PTSD Awareness Month. Service dogs are known to provide emotional support to individuals suffering from depression, stress and anxiety, including veterans dealing with PTSD. VA research is underway to better understand the range of service a dog can provide for veterans coping with PTSD. The IAVA members can click here to register for a VetTogether screening in their area.